We all have strange, irrational fears—from seeing ghosts in the bedroom mirror to being sucked into a mall escalator or finding yourself miles below the ocean's surface on the deck of a sunken ship. 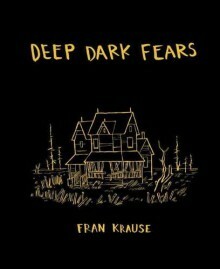 In Deep Dark Fears, animator, illustrator, and cartoonist Fran Krause brings these fears to life in 101 vividly illustrated comics inspired by his wildly popular web comic and based on real fears submitted by online readers. Deep Dark Fears explores our gruesome, hilarious, and bizarre anxieties, revealing a primal part of our humanity and highlighting both our idiosyncrasies and our similarities. This devilishly humorous guide explores our drive to experience and share the wonders of the world and the dangers lurking around every corner. http://readingfortheheckofit.booklikes.com Reading For The Heck Of It 5.0 Nothing to fear but fear itself? Not for the people in these books. text Nothing to fear but fear itself? Not for the people in these books.